I have done very little casting but always wanted to. More I read, more I'm convinced that i need to start from low tempreture stuff. But I read and try to learn. But keep it on rolling, I finally get it when a leg getts pulled. Well Pekka, the truthful part is I want to get the metal coming in at the bottom of the mold cavity, but using simple molding methods with this shape pattern, that area is inacessible. So one possible method of getting a passage for the metal to that point is to bury a horn shaped plug with the point down, at the spot where the metal needs to go, and then pull it out after the sand is rammed in place. Because it is both curved and tapered, it should come loose without disturbing the sand, and give a passage that you can pour into from above, and which chokes down to a small opening at the side and bottom of the mold cavity. Steve,it is a real possibility that real horns may have been used at some time,just considering the fact that horn is easily whittled and sanded smooth and it is also easily shaped by heating and bending. It therefore may not be such a silly idea after all.....OZ. But, I've already made the cheek flask the same height as the pattern, so a horn sprue will have to wait for another project! I didn't have enough time for doing much today, so decided to paint one of the two pegboard panels in the shop white. The walls were originally white, but after putting the dark brown peg panels up, I've been squinting a lot more! John Sevenson's mention in the sander thread reminded me that painting them was a gonna-do that maybe ought to be done-done. So i found an old gallon can of off white buried in closet in the house with about a pint of thickened paint in it -- why we were saving that I don't know, but perfect opportunity to kill two birds with one stone! A little water and it loosened up, and I removed the tools, painted, put them back and we're half way there. It does make a big difference in seeing things. Looking forward to doing the other side, and probably the galvanized metal ceiling, too. I had kind of noticed the machining pics I took were brownish. Must have been reflected light from the pegboard. Wonder if they'll be brighter colors now? You can't get too much white in your worksop. Especially if you are paying the electric bill and/or you are taking photo's. Now you have officialy got your spring cleaning started. Sarted to layout all the tools and bits that came with the new mill. 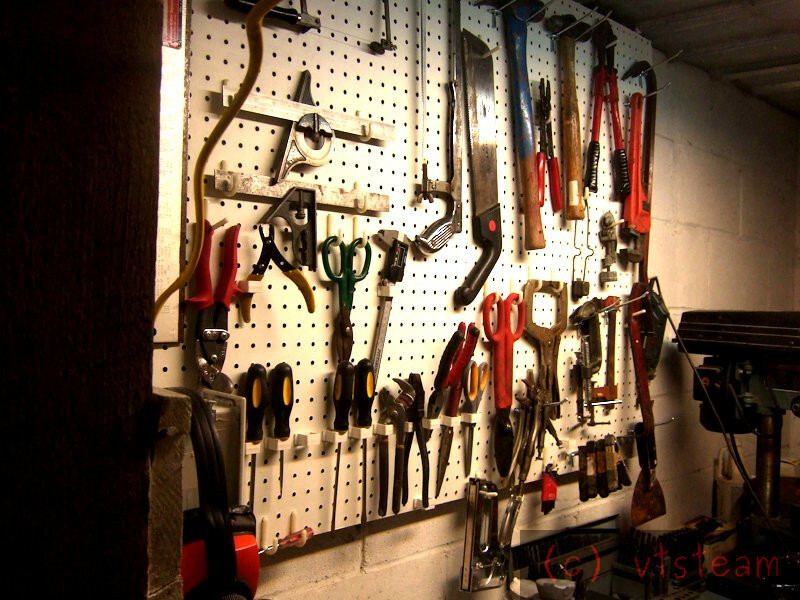 Black tools on black pegboard - not a good idea. So painted the boads white No Brainer. Also the strip lights in the shop are fairly old warm white. They should be called Wornout White. Got three new 5' Cool White strips and starters for £18 and when fitted gained one extra stop on the camera. It's been a little over two years since I posted anything in this thread, but today I finally tackled something that has been bugging me all that time -- no handles on the drawers. One of those small jobs I just never seemed to get around to. 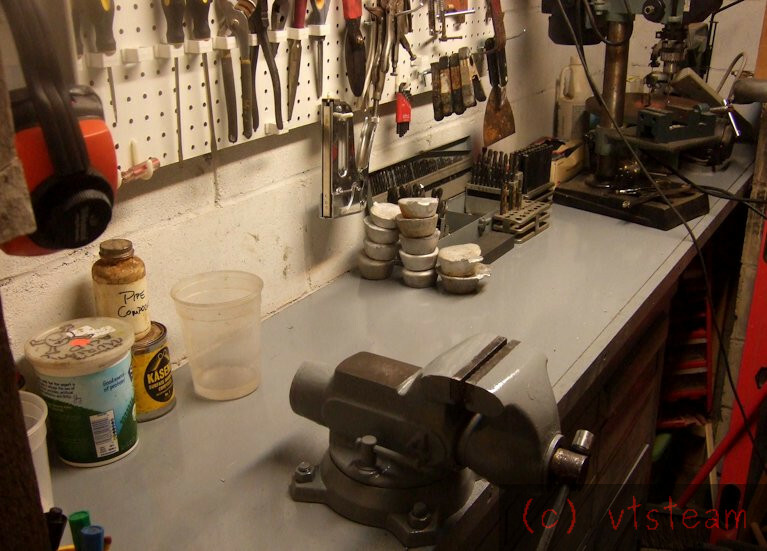 Today, anticipating working on my lathe project, and wanting to organize the mess that the shop had become after working on the cistern for two summers, I decided that the first order of the day was going to be making and installing the 15 drawer handles I needed. 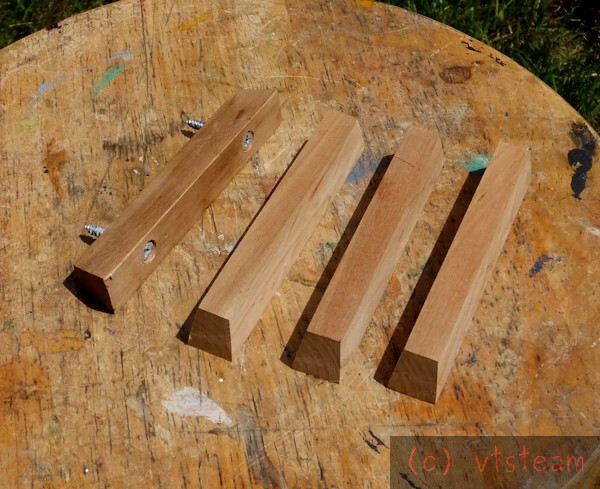 I used the old Gingery handle design of a wedge shaped wooden bar. Some scrap cherry, run through the table saw with the blade set to about 7-1/2 degrees -- ripping first, then chopping the ends at the same taper yielded a small box full of handle stock. Then I drilled and countersunk the wide face for screws. Nothing too bad in the shop. The new lathe doesn't look as shiny as it did, but we'll spiff it up as we go along. Photos restored after Photobucket broke the links.